It certainly has been an action-packed if somewhat confusing week on the football front in Westmeath. In a typical case of Murphy’s law a bizarre set of results left three teams: Garrycastle, Tyrrellspass, and Castledaly, all on six points fighting for two knockout places in section B. As Garrycastle had beaten the other two sides in the group stages the county board indicated that they would take second place in the group behind St Loman’s and the other two sides would contest a play-off game to see who got third spot. 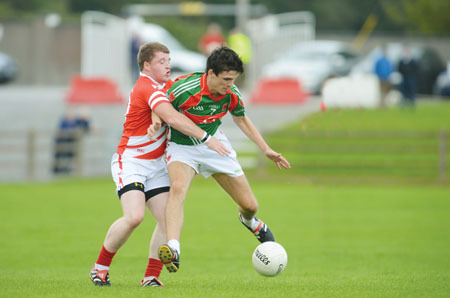 If this scenario prevailed then Garrycastle were set to face Athlone in a mouth-watering quarter-final. Tyrrellspass, who had a superior score difference to the others, successfully appealed the decision to Croke Park who indicated that score difference should take precedence where three teams are on equal points. The ‘Pass now take on Athlone in the quarter final this Sunday while Castledaly and Garrycastle must do battle also on Sunday evening to see who progresses to play The Downs in the other quarter-final. It must be particularly frustrating for Garrycastle who now find themselves contesting a playoff when they believed they were safely through. The whole episode is slightly embarrassing for the fixtures committee who in fairness admitted their mistake was genuine. The fact that the two Mullingar teams, who were already safely through to the semi-finals, fielded without a number of key players and at the very least underperformed has not gone down too well with a number of clubs around the county. While it is understandable that they have at least one eye on bigger battles down the road and are training accordingly, I expected both frontrunners to maintain their winning streak but that didn’t happen. In section A reigning champions Mullingar Shamrocks were a long way short of their best form as they lost out to The Downs. Even allowing for the fact that Ray Smith’s side were assured of a semi-final spot I would never have seen this result coming. Credit to The Downs for grasping the opportunity and securing second place in the group but having seen both sides in action in previous rounds I still can’t believe this result. Bunbrosna appeared to be cruising against an out of sorts Athlone when they held an eight -point lead entering the final quarter and also had the wind at their backs. A Ray Connellan goal was the spark that ignited the Athlone flame and further majors from Mickey Greene and John Stapleton helped us to get our noses in front. Bunbrosna drew level again and while a draw would have been good enough for Bun to progress, Athlone needed both points on offer. A late fisted effort from Mickey Greene gave us an unlikely win and more importantly sees us through to the knockout stages for the first time in a few years. Bunbrosna will regret their collapse in the final quarter as much as the shock result in the game that followed as The Downs’ win scuppered any hopes Bunbrosna had of progressing. Elsewhere in section A Maryland overcame a slow start to run out easy winners over C/F/C/W who now play Killucan in the relegation play-off. In section B Kinnegad’s win over St Loman’s was even more surprising than Castledaly’s win over table-toppers St Lomans. Kinnegad who had no chance of making the knockout stages kicked an impressive 3-12 against Garrycastle to record their second win of the campaign. Castledaly, who are capable of putting it up to anybody on their day, got the better of a Loman’s side who were without the services of both Paul Sharry and John Heslin. This win will be a huge confidence booster ahead of their showdown with neighbours Garrycastle.